This honey is the bees knees. Clear and golden, with a light taste, it's brill for baking, replacing sugar for a buzzing sweetness. It's raw, cold extracted and cold filtered, resulting in a more naturally fragrant finish. It's not heat treated or blended so you might see some granulation if it gets chilly. Slowly warm the jar back up (in a pan of water on the hob is a good option) to make bring it back to it's runny self again. We were delighted when we found Tony and his Littleover Apiaries honey making business. Organic honey is hard to come by, it took us a very long time to find some that met our ethical and quality standards; the most stunning thing we found out is that English organic honey does not exist. For honey to be certified as organic the bee-keeper has to have certified all land within a four mile radius from the hives as organic. This is why you'll find most organic honey comes from New Zealand, as they have the kind of space there to do this. 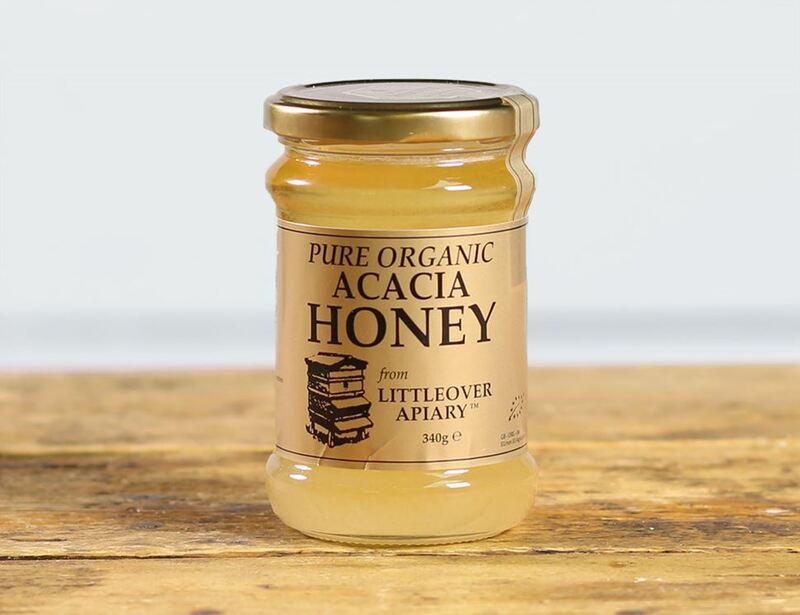 Acacia Honey* * = produced to organic standards. The perfect addition to a slice of toast or a bowl of porridge, our clear honey should be stored away from direct sunlight. Always ensure the jar is properly sealed. Not suitable for home freezing.